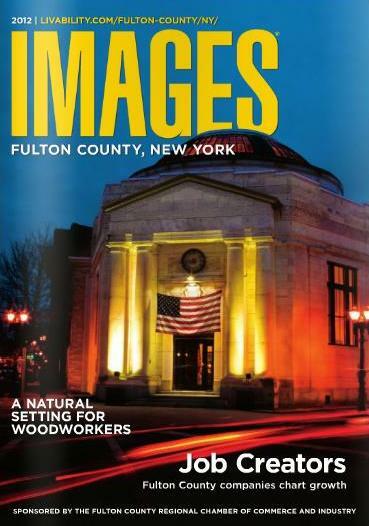 Gloversville, N.Y. - The Fulton County Regional Chamber of Commerce and Industry is pleased to announce the debut of Images Fulton County 2012, a spectacular new edition of its quality-of-life magazine that showcases the best of the community through all original features and photography. The Chamber, the Fulton County Tourism Department and select area businesses will distribute the magazine to prospective residents, visitors and other key venues such as medical, professional and real estate offices. Copies also will go out to attendees at various trade shows, conferences and events throughout the year. Images Fulton County is part of a complete publishing program that also includes an online edition of the magazine, a photographic video tour of the community, a targeted distribution network and customer retention and acquisition program. "This unique marketing publication is truly a collaborative effort, and we sincerely thank all of the local Chamber member businesses that supported the project through sponsorship advertising," said Terry Swierzowski, Interim President of the Chamber. Chamber member businesses are encouraged to enrich their sites or social media instantly with engaging community content by linking to Images of Fulton County 2012 online. Go to http://livability.com/fulton-county/ny. The Chamber invites its members and community residents to pick up a copy of Images Fulton County 2012 at the Chamber office at 2 North Main Street, Gloversville (open Monday through Friday, 8:00 a.m. to 4:30 p.m.) or at the Vail Mills Visitors Center during operating hours. The Fulton County Regional Chamber of Commerce & Industry, with over 850 members strong, is the leading voice of business in the region providing advocacy, resources and solutions for our members. Contact: Terry Swierzowski, Interim President, Fulton County Regional Chamber of Commerce & Industry, Phone: 518.725.0641, email terrys@fultoncountyny.org.